2175 Market Street, the home of Myriad. MLS photo from Redfin. Joey Picchi of The Myriad at the Mrs. Jones soft opening. Photo courtesy of The Myriad. It was just about a year ago when we first mentioned ~THE MYRIAD~—a new market hall with small businesses and a bar coming to the Castro (at the base of a brand-new apartment building)—and it’s now open. The partners in the 4,000-square-foot project are Jordan Langer, Pete Glikshtern, and Jeff Whitmore (from Jones, Oddjob, and The Midway), and they’re working with developer Forest City. The opening tenants are Antonik’s BBQ (flea marketers may already be familiar with the skewers from this popular food stand), Cro Cafe (you may know them from Temescal Alley), Raw (the juice bar also has a location in the Second Act Marketplace), Homestead Cookies, Church Street Flowers, and this is handy: AnB Cell Phone Repair (so you can enjoy a coffee while your phone gets fixed). There are spots for five or six more tenants, which will include butcher shop Gambrel & Co. (it already has a location in Redwood City) and Crêpes S’il Vous Plaît. A fun component to the project is the bar, called Mrs. Jones, obviously married to Tenderloin bar Jones. It’s located in a 20-foot shipping container that was placed inside the market. 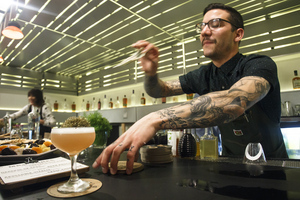 Look for a rotating menu of five to eight cocktails every other week or so, created by Joey Picchi, who is behind the cocktails at the group’s other establishments (Oddjob, Jones, The Midway). You can look at the opening cocktail menu here. There are are 40-45 seats, with even more coming (stand by for some barstools). A bonus is the outdoor seating, where you can kick it with your coffee outside. The Myriad opens at 7am for coffee and pastries and is open until midnight. 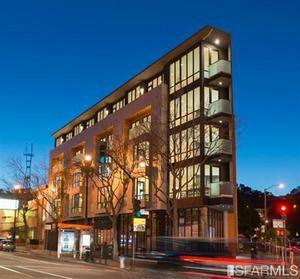 2175 Market St. at 15th St.